Before you take a quiz or test for the second time, you should always review every question on your first attempt, even the ones you got right. Take notes in your notebook/binder and use those notes on your second attempt. Make sure that you know HOW to do anything you missed BEFORE you start that second attempt! Use all your resources to find out how to do them. 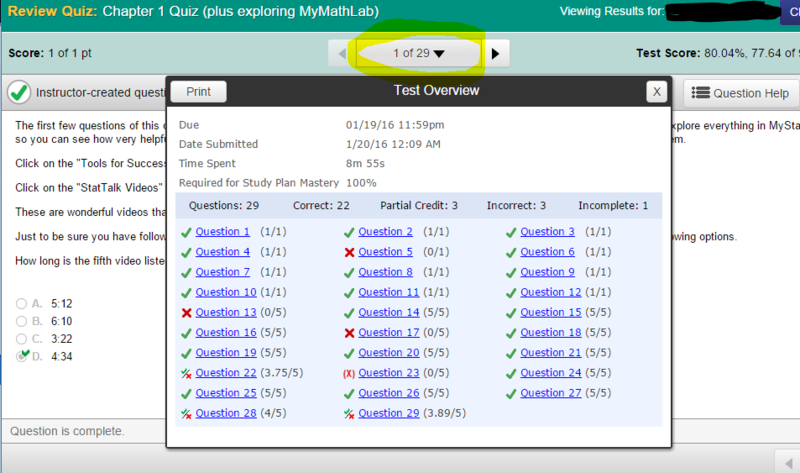 Step 1) Log into MyMathLab/MyStatLab. Just click on the question to see the question and answer. The questions with a red “x” were incorrect or partially incorrect. 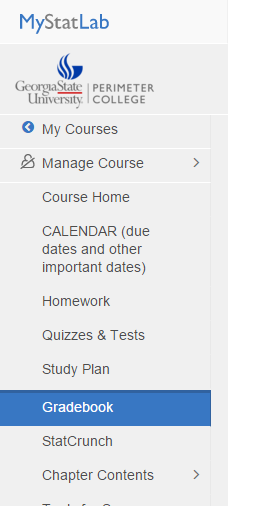 When you click on the grey bar at the top (circled in yellow) it will bring up the list of questions. Again, the red “x” means it was wrong or partially wrong. IMPORTANT : To see what you answered and what the correct answer is, click on the specific question you want to see. The answer that you see when you look at the question is the CORRECT answer. To see what YOU typed in (that was incorrect) use your mouse/touchpad/cursor to hover over the answer. A box will pop up and show you what you typed in. You must hover over the answer to see what it was that you answered because the answer that shows in the blue box is the CORRECT answer. Always be sure to figure out WHY you got the problem wrong so you won’t make the same mistake again on your second attempt, or on the midterm or the final exam. Look back at similar homework problems, videos, class resources, etc. to review the topic.